I believe that for many of us who search for truth and enlightenment, there is a tendency to escape into it. Not so much an escape into enlightenment but into the process of finding it. We are dissatisfied with the status quo and are looking for something else. When we begin the new journey we then become involved in the journey to the exclusion of life that is occurring around us. Life was never meant to be about escaping and finding enlightenment. We are not here to find our way home. We are simply here to experience all aspects of physical life and in doing so we will find our way home. Searching for the truth or dedicating our lives to finding enlightenment is just another subtle form of suicide. It is a way of separating ourselves from others that we share the planet with, for all reasons practical or not, we are running away. Before enlightenment comes chopping wood and carrying water, after enlightenment, comes chopping wood and carrying water. 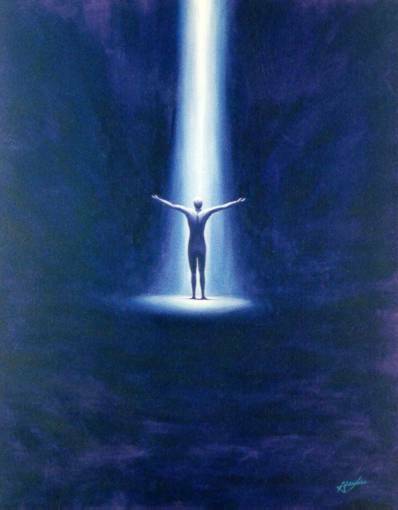 Enlightenment is not an escape from physical reality but can enhance the experience. If you understand how physical life works and its purpose, it simply makes the experience less fearful and perhaps more enjoyable. Seeking to find one’s truth or enlightenment is no more mutually exclusive than delving into one’s work at the exclusion of one’s family and social life. It should not be a substitute but an add-on to it. I know that as one begins the experience there is a tendency to want to know all there is and get lost in it and as we find some of the nuggets we become drunk with finding the mother load. I like to equate the journey to learning a new language. As we get closer to speaking it fluently we have a strong desire to speak the new language and use it with others that understand. We start relating less and less in the old language and to people that knew us before. Some of these people will move out of our lives because they don’t understand us, and others will try to hold us back because they don’t want to be left behind and a few that can see the benefits of change may want to follow and try to catch up. With new skills and learning comes the desire to use them. We gain enlightenment at the expense of old beliefs and understandings and a way of life, unless we can view the old life as a step to the next. These events are noticeable and completely understandable, we have new toys and we want to play with them, we have new clothes and we want to wear them. However the experience should not be an excuse to drop out of life or it’s experiences and close ourselves off from others. In my experience I have found the trip to be a solitary one. I have locked myself away in my little office at home and spend hours everyday writing. Through this medium I am able to express myself and bring out my thoughts in coherent patterns that paint the new image I have of my model of the world and my relationship to it. Solitary by nature, I have excluded all others to allow myself the time and peace and quite to do this. Perhaps this is what was needed to bring out the new thoughts and I just may not be at the place that it takes to put them into practical use in interaction with others. I have effectively alienated myself from others in an attempt to bring some of this stuff into daily practical use. People look at me strangely and may politely listen or some may change the subject very quickly, others are drawn to me and I have developed a teacher-student relationship with them. However in the place that I now dwell, I am alone. I have found also that amongst those that are at an advanced stage of enlightenment, they prefer not to speak of it on a physical level, but opt for subconscious communication with the knowingness that we are all connected and in constant communication with each other. I have learned long ago not to help unless asked. I do however hang out my shingle in this form for those that may come across my sign. I consider these as opportunities for me to further express myself and expand my awareness. Awareness and enlightenment are really valueless unless they can be experienced. This is the dilemma that the creator found itself in, that is why he created relativity and the corporeal world, so that awareness could be experienced physically. We are a manifestation of the creator experiencing itself physically. This awareness can be likened to knowing that you can fly, but not being able to experience it, it is just a concept, or like knowing how to play music and not having any kind of instrument to play it on. As one involves themselves in the search for awareness and enlightenment, they are at great risk in loosing a very important social dynamic… involvement with others. Why go to a movie if you have no intentions of watching it? Curious minds may want to know, but is it necessary to live a happy, and fruitful life? I don’t believe that it is if one is content to accept everything as it is or is thrown at them. For the explorer, life as we know it is left behind in the quest for new thoughts, new realms, and different ways of life. It is for the sake of the discovery, nothing more and it is a sacrifice for a promise of something better than what one is experiencing now that drives her forward. Awareness if nothing else teaches that when you leave home, you are simply returning to it… a circular path having no beginning and no end. Before enlightenment there is chopping wood and carrying water, after enlightenment….